There’s a new pattern in the Crochet Spot Store! Pacifier holders are great if you’re always loosing your pacifiers. The end of the pacifier holder that is appliqued with an animal is clipped to the baby’s clothing while the other end dangles with a pacifier. These holders can also be used for small toys, not just pacifiers! Pacifiers and toys can easily be removed from the holder so that they can be washed. 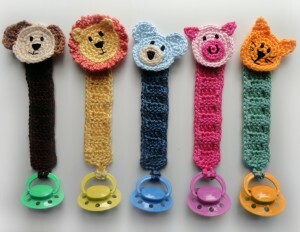 The pattern includes the pacifier holder pattern that you can crochet in an assortment of colors, and the 5 animal appliques: bear, dog, cat, lion and pig. This entry was posted on Sunday, July 8th, 2012 at 9:15 PM by Rachel Choi	and is filed under Best Crochet Patterns. You can follow any responses to this entry through the RSS 2.0 feed. You can skip to the end and leave a response. Pinging is currently not allowed. These are so adorable!!!! I would never have thought to do something like this. I can’t wait till I become a member and download this. I have two friends that are expecting and would love to give these!! !